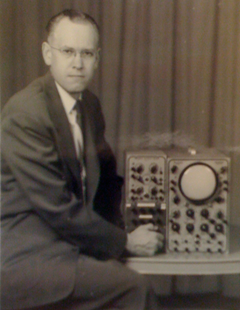 Ben Laposky (1914–2000) was an American mathematician, artist and draftsman from Cherokee, Iowa, who has been credited as the pioneer of electronic art, making the first computer graphics. After his service at the US army until middle 1944, Laposky returned wounded to his original work in Cherokee, but was no longer able to climb ladders as is required by a sign painter, so he focused on lettering smaller cards and draftsman. He established a sign shop, took extension courses in elementary drafting from the University of Chicago, and dabbled in art in his spare time, envisioning "painting with light". 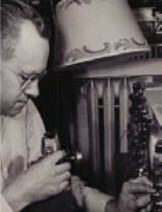 In 1946 Ben began working with photographic pendulum tracings and harmonograph machine patterns. In 1947 he read an article in Popular Science magazine which proposed the use of television testing equipment, such as cathode ray oscilloscope, to generate simple decorative patterns, based on in formula similar to that which governs pendulum curves. This stroked his imagination and he began to investigate the proposal. 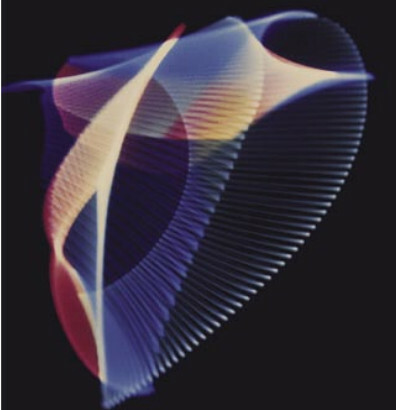 In 1950 Laposky used a oscilloscope with sine wave generators and various other electrical and electronic circuits to create abstract art, so called "electrical compositions". These electrical vibrations shown on the screen of the oscilloscope were then recorded using still photography (see the nearby image). Later in 1957 he used motorized rotating filters of variable speed to color the patterns. 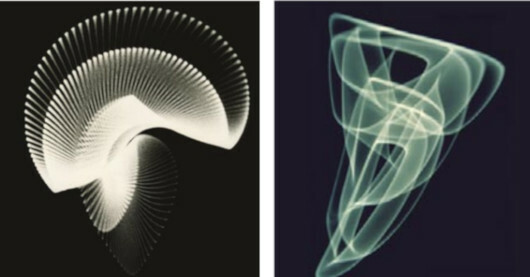 Laposky was interested in showing the designs or patterns based on natural forms, curves due to physical forces, or curves based on mathematical principles, such as various waveforms (sine-waves, square waves and Lissajous figures). According to the exhibit documentation, Laposky pointed out a parallel between his oscillons and music, the operator of an electronic setup playing a sort of visual music. Fifty black-and-white images of Laposky's photographs were exhibited in 1953 at the Sanford Museum in Cherokee, and later his work was shown throughout the United States and in Europe (see his presentation at the Iowa Academy of Science). His work was featured in over 250 books, magazines, newspapers, advertising art work worldwide. I got into oscillographic art through a long-time interest in art or design derived from mathematics and physics. I had worked with geometric design, analytic and other algebraic curves, 'magic line' patterns from magic number arrangements, harmonograph machine tracings, pendulum patterns, and so on. The oscilloscope seemed to me to be a way of getting a wider variety of similar kinds of design and with controlled effects to produce even newer forms not feasible with previous techniques. My interest in other kinds of art was to some extent in abstract geometric painting, cubism, synchronism and futurism. The oscillons are related to the newer developments of op art, Lumia (light) art, computer art, abstract motion pictures, video synthesizer (TV) art, and laser displays, such as Laserium. Oscillographic art might be considered as a kind of visual music, as the basic waveforms resemble sound waves. I used sine waves, saw tooths, square waves, triangular waves, and others in various combinations, modulations, envelopes, sweeps, etc. Oscillons usually are not accidental or naturally occurring forms, but are composed by the selection and control of the oscilloscope settings and of varied input circuitry. I used especially modified oscilloscopes for this work, as well as some of my own specifically designed electronic instruments. The oscillons may be created without the use of an analogue or a digital computer system. It may even be possible, of course, to imagine or to compose some of these patterns without the use of the electron beam tracing them on the cathode ray tube. However, the electronic method greatly extends the possibilities of obtaining new and aesthetically pleasing figures. The oscillons are intended to be a form of creative fine art. Benjamin Francis Laposky was born on 30 September, 1914, in a farm south of Cherokee, a small town in Iowa, United States, to Peter Paul Laposky (1884–1959) and Leona Anastasia (Gabriel) Laposky (1888–1931). Ben had a younger brother, George Raymond Laposky (1916–1975). In 1918 the Laposky family relocated to Colorado Springs, where in 1931 Leona died. 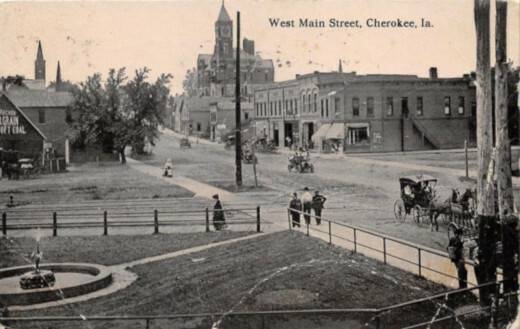 In 1932 Ben graduated from St. Mary's High school, Colorado Springs, and shortly thereafter, the family moved back to Cherokee, where he began working as a sign painter and draftsman. From 1934 through 1946, the newspaper Believe It or Not! of Ripley had printed 77 of Laposky's Magic Square puzzles. In total 117 of Laposky's geometric number arrangements ("magics") were printed in the newspaper. He wrote about his magic square: The crystallization in numbers of some small part of the beauty, harmony and rhythm or the universe. His work on these number matrices lead to his election for membership in the Mathematical Association of America in 1950. In the spring of 1942 Ben joined the US Army and was inducted into Fort Des Moines. He scored 134 in his army general classifications test, which put him up in the upper 5 percent of what the army classified as the ability to learn rapidly, and his mechanical aptitude test was 145. Soon Ben was sent overseas with the 43rd Infantry division headquarters general staff section assigned as a map draftsman. In July 1943, Ben was heavily wounded in the right foot during a Japanese bombing raid at Rendona Island, Solomon Islands. Then he received the Purple Heart, and spent 10 months in army hospitals in New Zealand and Alabama. He was discharged with disability in May 1944 after two years of service, returning to his home in Cherokee. Soon Laposky established his own sign shop in Cherokee, Iowa (and dabbled in art in his spare time), where he died on 15 March, 2000.